Part of the Stories at the Museum category. This family friendly program features special educator-led readings of children's history books and a craft activity. 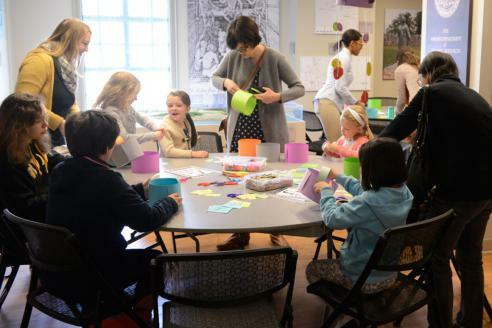 Stories at the Museum programs are open to all ages. Programs take place every month on select Saturdays at 11:00 a.m.
Each month the books will have a different theme. May 18 – It's Challah Time! Come join the fun at the Virginia Museum of History & Culture! Enjoy craft activities at the VHS. Children create crafts related to the story they read in the VHS galleries. Explore the story of four female African American mathematicians at NASA and how they overcame gender and racial barriers to succeed in a highly challenging STEM-based career. The narrative of George vs. George introduces anew the two enemies, both named George: George Washington and George III. This is the story of one brave family: Mildred Loving, Richard Perry Loving, and their three children. There were signs all throughout town telling eight-year-old Connie where she could and could not go. But when Connie sees four young men take a stand for equal rights at a Woolworth’s lunch counter in Greensboro, North Carolina, she realizes that things may soon change. Experience the nation’s most popular toys and their stories through three imagined living rooms that bring the decades back to life.